Our pledge to our customers. Quality and service first. We love our pop up tent! Thanks for the fast turnaround. The tent got here just in time for our hiring event. Mark A - Prudential: Really pleased with the quality. James M - OneStaff : Top notch tent forsure. Paul wasn't joking when he'd mentioned that our tent was gonna ship out the next day! We paid extra for shipping, but the tent was worth the money! Chris N - Red Cross: Tents came out great! You have a customer for life. 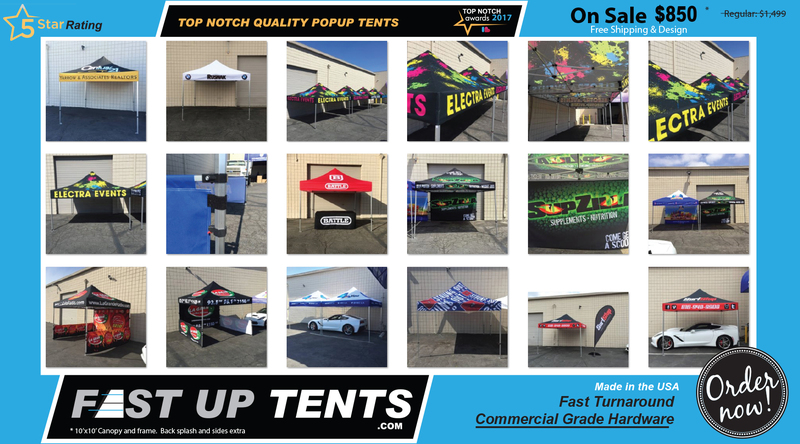 FastUpTents.com offers high quality custom pop up canopy tents at a great price. Let our graphic designers put an effective and great looking design together for your business. Our tents are proudly made here, in the US. Our standard turnaround time is 2-3 days. Same day print and next day shipping are also available. Please contact our reps with any questions you may have. We offer free graphic design with no obligation to buy and template downloads for the graphic designers or companies that would rather design their own.